I'm not a huge fan of mustard as a condiment. (As a general rule I hate most condiments, mayonnaise most of all.) So while I might not choose to spread mustard on a sandwich, as a color I love to add a touch here and there. Today's outfit just happens to have a whole lot of mustard going on. This mustard colored pencil skirt is from the J. Crew Factory and I love not only the color, but the somewhat tribal print pattern it features. Its pattern was a reinvented version of the J. Crew Scroll skirt of last year. Nothing pairs better with mustard than navy blue in my opinion, so I added some navy and white polka dots on top and a denim jacket to complete my mustard inspired look. It's like a denim, polka dot sandwich with a touch of mustard. Yummy! Too cute of a combo, girl! And you've reminded me that I need to get that skirt out of my closet and give it another spin! Thank you Lisa! 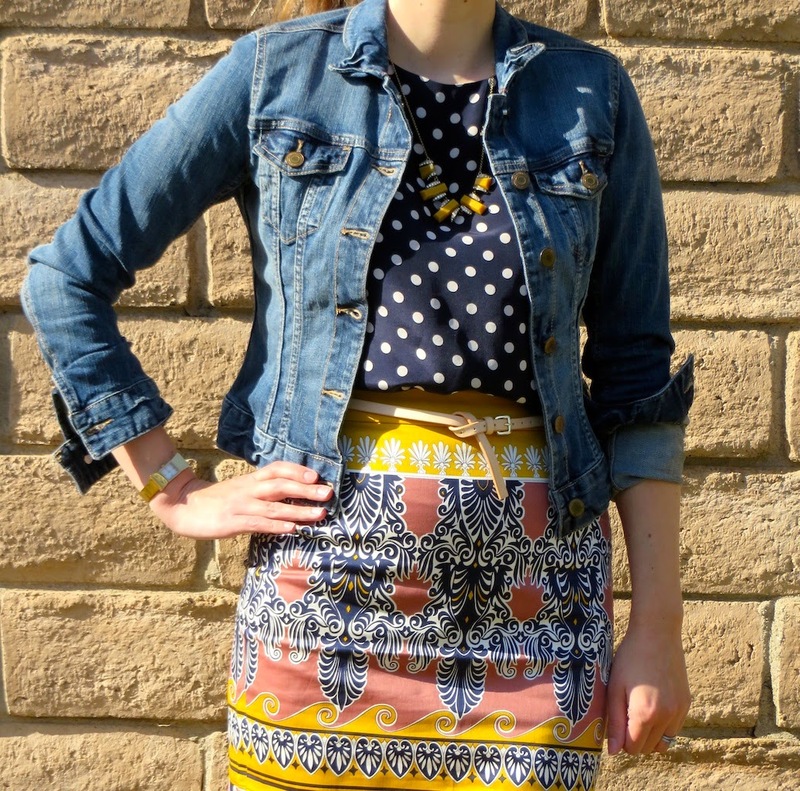 I can't wait to see how you style this skirt for spring! I definitely love this color! Me too! We seemed to have almost the same color palate on last week! Mustard is just lovely - I really like this outfit Katie! Thank Laura! I think mustard is a lovely color too. It's very versatile.